Sophie Skelton, who currently stars as Brianna in the hit Starz series Outlander, is making another big splash in the action thriller, 211. In the film, she play’s Nicolas Cage‘s estranged pregnant daughter who’s world “turns upside down,” she said. In this interview, she chats about her role, working with Cage, how she perfected her American accent and of course, Outlander. It looks you’ve got a ton of things going on. Are you really busy or just does it seem that way right now? Sophie Skelton: Yeah well, it has been actually it’s been quite full on. So, we started shooting and then we had to have a little break because Cage broke his ankle. And then we had about a six week hiatus. So that was interesting. But yeah, lately its just been busy with mainly Outlander, we’re shooting season four now. So, I’ve been in Scotland since January. When you get a six week hiatus, do you try and find something else to do or are you just kind of hanging out? Sophie Skelton: It’s hard, you end up just hanging out but I think I was shooting anyway actually. I was supposed to wrap so for me it wasn’t too bad but yeah, it just kind of nice, fun vacation. Let’s talk about the film. You played Nicolas Cage’s daughter? Sophie Skelton: Yes. So, I play his daughter and the wife of his partner. We have a very strange relationship because her mother died not too long ago from cancer and she’s suffered for quite a long time. And he got sort of very detached from and put himself and into his work. And obviously being part of the police force, he is very good and very passionate about his job. And ironically, when the day hits he is ready to retire. But Lisa does sort of hold it against him that he was very absent during her mother’s illness. So the film sort of starts with, we see Lisa finding out that she’s pregnant. And Dwayne [Cameron] and I decided to play it that they have sort of been trying for a long time so it really is this ecstatic news and a lot of relief that it’s actually worked out for them and I think Dwayne’s character really thinks that this can sort of fix the bad blood between father and daughter and maybe things really start to connect and have that family unit back. And then obviously the day I’m told then it’s all just goes all loony really and then for Lisa her world just gets turned upside down so. Yeah it’s a great part to play, very harrowing and yeah a complete 180 flip from beginning to the end of the day so. I’ve talked to a couple of people who have worked with Nicolas Cage and they said he’s just as great as you would think he would be. Everything about him is just interesting. How was he to work with? Sophie Skelton: I think if you watch him, you can always tell that there’s just something else going on behind there, like a deeper level of him that he might not always choose to show in certain scenes. But then he really can delve into that in more emotional scenes. He really is, he’s such a complex character on and off-screen. Which is really great, he’s very interesting to talk to, very wise, has a lot to say. He’s great, a lovely man, really nice guy. You and Dwayne got together and sort of created your own sort of couple’s back story? Sophie Skelton: Yeah, very quickly, on that day. We didn’t have any rehearsals on the stage or get to meet before shooting. It was all quite last minute, so yeah. We did it sort of the morning of. Yeah, so it’s just great to see it develop. It was great, Dwayne is wonderful and easy to work with, great to get along with so it just hit really perfectly on the day. So it was lucky. I’ve had to play parts where I meet the person playing my wife of like five years or girlfriend that day and then we have ti make out. It’s always just so strange and weird to do that. Sophie Skelton: Yeah. “It’s nice to meet you, you’re married!” Play husband and wife, and you’re like, “Yeah.” No it’s great but that’s where it’s good because I’ve worked with the Millennium guys before and everyone’s lovely and it’s always such a nice crew. It really does feel like a family unit so everyone’s really comfortable. We’re good with each other so. Same with Richard [Rankin of Outlander], I met him on the day of shooting too. 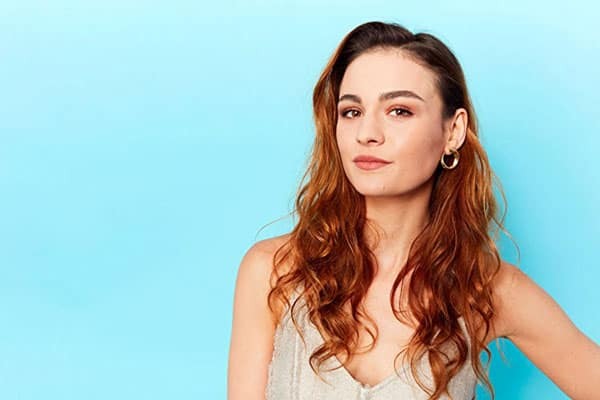 Sophie Skelton: Yeah, quick introduction. With Outlander, were you familiar with the books or the series before you got the audition? Sophie Skelton: No. I actually got the audition, I think in like 2015? I got it a year before I was actually cast. So the audition came through and the first series wasn’t out yet. So, I quickly googled the books, ordered one at the bookstore and tried to have a quick read. But then I did the audition and didn’t hear anything for about a year. So, I figured that it had just kind of been and gone. They were gonna bring the character into the end of season 1 and then ended up bringing the character into the end of season 2, so then when it came back round again, I had more time to prep and I’d read the books. And then yeah, just sort of read. We’ll I’m not in book one, so I actually read books two to four just to prep because a lot of the sides that I had to audition with were from book four, which is actually what we’re filming now. I hadn’t realized what a sort of phenomenon the books were and how much of a fan following the books had. It wasn’t something that was really on my radar, but then when it was I kinda realized the extent of how popular the books had been. Were you prepared for this rabid fan base? I know you’ve been to Comic-Con at least once, right? Sophie Skelton: Yeah. Just once, yeah that was an experience. It was amazing. The fans are very avid, which is wonderful to see. I never really had too much of a warning initially. I did had a slight one just sort of go there so the Twitter’s gonna blow up and things. You don’t really believe the magnitude of that until you see it. It is great, it’s wonderful to have such a loyal fan base. It’s great, because also now you know you’ve got people who are book fans and people who are just show fans, so it’s really nice having that freedom to tailor the story to book and TV fans alike. The show has got to help you with your fan base because now people say “Oh, she’s in this new movie.” That helps I would think. Sophie Skelton: Yeah, yeah, definitely. I mean what’s great about 211 is I’d worked with the producers before so I did a film and they actually just asked me to come back and play Lisa, which is really great. And it kinda figures that your character has an American accent. And it’s flawless by the way. Sophie Skelton: Oh, thank you, thanks. Did you practice an American accent before or did it just come naturally? Sophie Skelton: In all honesty, I think I watched too much Friends when I was younger. So, I think I was just inundated with the accent from a young age which worked out great in the end. Sophie Skelton: Oh, worst audition? I was 15, it’s probably one of the first auditions I ever went on and it was for a TV show and I think it’s been canceled now. I can’t remember what it was something like Tudors, something like that. And it was to play like a tribal woman at this big feast, a dinner. And the tribal woman, obviously the tribal women also had to dance round the table. We had no pre-warning. So, I had to go into the audition and just sort of dance around like a tribal woman which was just bizarre to be honest. 211 is streaming everywhere, including Amazon. Outlander returns soon to Starz.